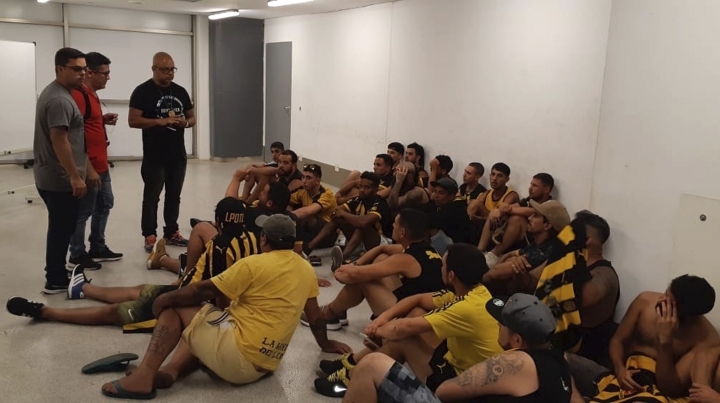 RIO DE JANEIRO — Police say they've detained nearly 100 fans of Uruguay's Penarol soccer team following a brawl with fans of Brazil's Flamengo club hours before a Copa Libertadores match in Rio de Janeiro's Maracana Stadium. The police department's press office says the confrontation broke out Wednesday afternoon in Rio de Janeiro's Leme Beach when Flamengo fans approached the visiting Uruguayans as they waited to board buses for the stadium. One Uruguayan fan was injured and listed in serious condition after being punched, kicked and beaten with chairs and pieces of wood. It's not clear if any Brazilians were arrested. Video images posted on social networks show police officers watching the brawl without trying to stop it. The police department said the officers have been placed under "administrative detention."